So you're a Director or Producer who trolls on Vimeo for creative ideas and inspiration. After weeding through a gazillion time-lapse and steadicam videos, you've hit on a school of ridiculously beautiful aerial shots. You keep telling your creative inner self, “We’re gonna find a place for this scene in a project!” Then the perfect project rolls around, and you put the shot into the storyboards and base another 3-4 shots on this visual hook because the ideas is so awesome. And you're super stoked. Then the Buzzkill happens: your production manager calls and asks how exactly you intend to capture said beautiful aerial shots? How will you shoot these shots in the allotted amount of time? How on earth can they fit within the budget? Will the FAA, insurance, and your client allow you to get the shots, especially when people on the ground are involved? See below for a montage of the footage we shot over the city of South Bend, Indiana in about 1.5 hours of fly time. As a Narrative Device - When wanting to use camera movement to reveal your subject or an object. These might include dramatic jibs from the ground up the side of a building, or flying from behind a row of skyscraper windows to reveal person looking out the window on the other side. Lower Altitudes or Through/Under Objects: If you're wanting to shoot from lower-altitude, or track under a bridge or through branches in a park, a UAV provides beautiful and dramatic results. Dollies over Long Distance: Want to follow a person walking down 100 feet of sidewalk? Want to make a dramatic dolly in or out of a scene? A UAV can accomplish this easily and without near the amount of crew and equipment normally required. 360 Degree Shots: As Long as the Object is not so big the operator loses sight of the UAV, a Drone works perfectly to spin around objects, especially at lower altitudes. Smaller Budgets/More Time: When you have less budget and more time, a UAV is perfect. They generally only cost between $2,000 - 4,000 per day for crew + equipment. But treat this like any other big piece of equipment; changing locations and scenarios takes time. A UAV can can only fly for about 4 minutes before having to change batteries, another hit on your AD's schedule. Other quirks like WiFi interference and Satellite availability make a UAV a more time-intensive option for aerial footage than a helicopter. Higher Altitudes: When needing panoramic shots of large areas like Cities, Scenic Vistas, or Events. Vehicle Scenes: Following vehicles, tracking vehicles from the side, showing cars driving on a course or winding road. Heavier Camera Rigs - When your DP wants to capture using a RED or ARRI with bigger lenses. Long Distances - A good rule of thumb per UAV operator is if you are in a fixed position, a UAV can only go 1/4 mile before control starts to lag. A Helicopter can fly much greater distances, pretty much until the pilot runs out of gas or you run out of card space or batteries. 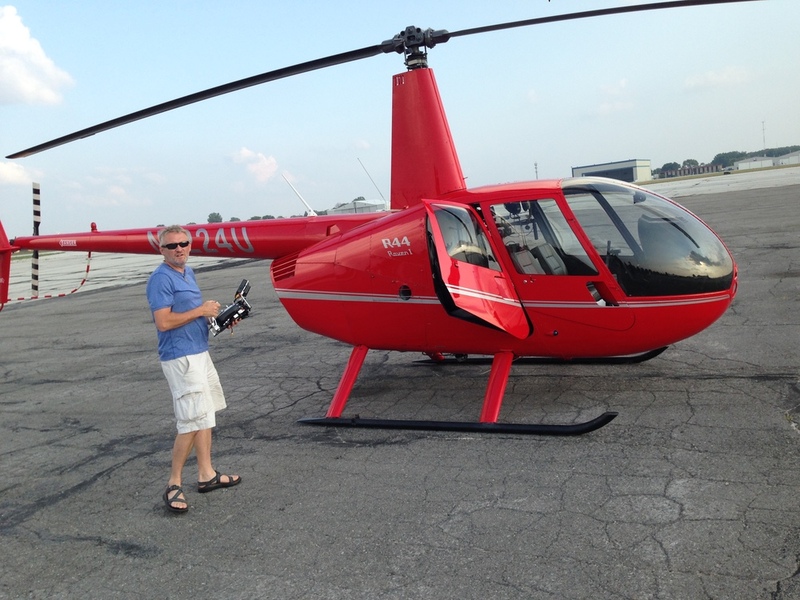 Bigger Budgets: When you have more money and less time to spend on aerial footage, a helicopter is your best bet. Normally a camera mounted to the helicopter (think any big-budget Hollywood action movie) uses a Cineflex, Tyler Mount, or Flex Cam and will start at $20,000. The longer you shoot, the more that cost goes up. A cheaper helicopter solution made more possible by Steadicam Gimbles like the MoVi or gStabi H14 technology, is for an operator to take the doors of a helicopter and use a gimble to shoot out the side. This normally starts at around $5,000 and goes up per hour from there. More expensive than a UAV, but far cheaper than a true mounted gimble. We had a list of more than 10 locations spread out across a city area with a 15 mile radius. To shoot all of these shots with a Drone would easily take an entire 10 to 12 hour shoot day. We would’ve had to find a place to takeoff/land at each location, plus by spreading out the scenes across a full day, the lighting would not be optimal for each location. Using a helicopter we were able to shoot every scene in under 2 hours, right before dusk and sunset for optimal magic hour light. Weight - We were filming in 5K on a RED Epic, so I definitely wanted to shoot using a Cine Lens. Stepping down to a lightweight zoom would sacrifice quality, but to shoot with any Cine Zoom, the weight makes the camera front heavy, making it difficult to balance on a UAV's gimble. The weight of the RED with Zoom on the helicopter was a non-issue, making the use of a helicopter a no-brainer. Our setup was perfect for our budget ($5,000 - 7500). Kevin shot from the side of the helicopter (yes, doors were off yikes!) using a gStabi H14 Steadicam Gimble, while I sat in front and operated the Tilt/Pan function with a RC Controller and a monitor attached to the top. This gave me the ability as a Director to both critique the shots and do something about making them better, a win-win for any creative. See below for the Full 4K resolution file, you can click to play but I would recommend downloading this file as it is around 600mb. I hope these lists are good starting points for you when planning your next Aerial Footage Scene. Look at each UAV vs. Helicopter choice as a case by case basis. After going through the Top 5 Reasons to Shoot with a UAV or Helicopter above, make sure you consult with local authorities and air traffic control to see which option they are most comfortable with you pursuing, as the local officials are going to ultimately be the ones who control which option you choose. Good luck filming aerial footage! Jeremy Pinckert is a Director of Brand Films and Commercials. His work for Production Company Explore Media has won Tellys, Best in Show ADDYs, and an Emmy Award. You can follow him on Twitter @jeremypinckert, LinkedIN, and see his commercial portfolio reel.